The innovative and premium design of the Adaptive Motion Trainer® (AMT®) 835 takes fitness to a whole new level with the addition of the Open Stride™ feature. This single piece of equipment fully engages exercisers of all fitness levels with an infinite range of stride paths to create a uniquely effective low-impact workout, making every workout a personalized experience. Dual action provides both upper and lower body workout. Arms are engaged with pushing and pulling motion to provide the ultimate in total body engagement. Open Stride™ is a unique feature that allows exercisers to adapt their stride height from 6.8 to 10 inches (17 to 25 cm) and stride length from zero to 36 inches (0 to 91 cm). The contemporary, thoughtful design of the new TRM 835 delivers exercisers unparalleled feel and quiet operation while facility operators experience optimal performance and durability. New and improved progressive shock absorption system that absorbs high-impact movements and supports a solid and controlled push off. Fully complements exercisers natural running stride, reducing joint stress and fatigue. 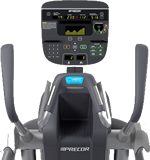 All of our new Precor and existing Precor equipment has been enhanced with TV and audio controls to allow for a more relaxed and entertained cardio experience. Please reach out to our knowledgeable staff for an introduction to our new equipment and features.